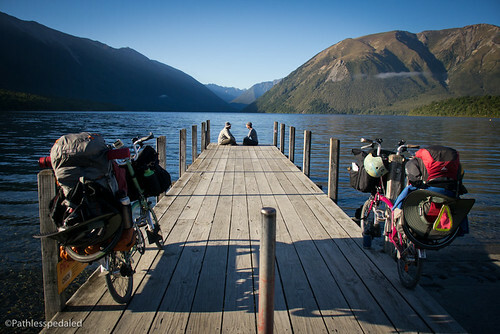 When we first set out to do the Kiwi Chronicles it was because I wanted to record our journeys in a different way. We have written and photographed our adventures since 2009 so video seemed like the next logical step. Our years on the road has taught us that good storytelling on the road is harder than it looks. Lots of factors are against you. For starters, you’re riding your bike most of the day and when you pull into camp, firing up the laptop and editing photos, videos and writing copy are usually the last things you want to do. Also, sometimes it can be challenging to find just the right person to tell the right story. Some stories are great but are too large and nuanced for certain media, or they are interesting, but don’t add to the overall narrative arc and you have to cull it, or sometimes the story you thought you wanted to tell changes beneath your feet. In the end, I’m pretty proud of the video series we put together. It took lots of hard work constantly setting up shots, talking into the camera when you don’t feel like it, searching for people to interview and editing editing editing. Travel videos can easily be too solipsistic and I wanted the video to be more than just about us kvetching about hills and wind and I think we achieved that. It was all on the job training, so to speak. I had literally got a hold of the camera and audio gear about four days before we were to hop the plane. In the middle of the trip I was teaching myself Final Cut Pro (episodes 1 and two were put together in iMovie and the rest in FCPX). I like to think that as the series progresses, the videos get a little bit better each time. There are massive amounts of footage, interviews and vignettes that were cut. I’ll probably put together a few more shorts from it all. For now, sit back and enjoy the complete Kiwi Chronicles from beginning to end. Special thanks has to be given again to Bicycle Times and Adventure Cycling for partnering on the series. Bravo! It was so fun to travel with you on this trip through your videos. Well done. Can’t wait to find out what adventures you are planning next! Beautiful job with the videos and all the photos. And, once again, thanks for sharing. Which Olympus did you like? Any further thoughts on the Bromptons / LHT comparison? Ended up taking the EP3 and the Lumix GH2. I think the EP3 takes better photos, but the GH2 was convenient because I could switch between stills and video faster…so I actually ended up using the GH2 a bit more. Bromptons and LHT are two different beasts. If you’re doing paved roads with mixed transit (bus or train) the Brompton is hands down the winner. For rougher roads or when you need more carrying capacity the LHT is the winner. We’re keeping them both and may alternate in the future depending on the trip. Great Job on the video. I really enjoyed following along. I’d love to see a “How to” on your process some day. I’ve been looking forward to watching these. I really enjoy all your videos, even before you got more advanced tools. And thanks for posting them to YouTube also! That allows me to watch on my TV, through my Xbox. Thanks for the videos – very nicely done! One thing seemed odd. In at least two videos, you mentioned having good and bad experiences on the trip. But the videos never talk about the bad parts – well, except maybe hills and rain. Were there more difficulties? Hostile drivers? Unsafe conditions? Equipment stolen? I am left wondering. But overall, it looks like a blast! Thanks for sharing! Thanks Sarah. Yes, there were some interesting road incidents, such as getting tackled off the bike and getting punched in the face. I shot the footage but decided to leave it out of the episode since it would make the video too long and didn’t add to the overall narrative arc of the episode. Just some of the things that were cut but hope to make little shorts of.